As a byproduct of The Language Switch, I was invited to send a guest post to Bitesize Irish Gaelic, a wonderful site where you can learn Irish gaelic online. Last year I decided to learn Icelandic because we were going to Iceland, this year I was learning Gaelic... Thus we decided that Ireland might be a good place to visit this summer on holidays, encouraging me to learn better this new language. As I began my course in Bitesize Irish Gaelic, I saw it is an interesting language (but for me most are), more so, it was a well-planned course with friendly people in the forums, I decided to get a little more serious about it. In addition to all this, for my birthday, Laia bought me a book titled Teach Yourself Gaelic, from my beloved Teach Yourself series (the same collection where my book on Icelandic sits). We were very surprised when we discovered it was a book on Scottish gaelic! I was challenged with a new language, somehow as a dialect of another I am learning currently. It is not formally a dialect, but the two languages are very closely related. If I can learn one of them, I can learn the other... And probably at the same time. How could I miss this language train? I've been thinking lately about effective ways of language learning applied to languages with not so many speakers, where you can't count on immersion (some of which I wrote in the guest post I was talking before), and I'll try to implement them to learn Scottish gaelic with the help of this book (as a source of grammar and vocabulary). Maybe we'll end up going to Scotland? These next three months I will blog here about the process of learning a new language from level zero without any language immersion whatsoever and see how far I can take it in three months. I'll share with you all my tips and tricks along the way. Stay tuned for new updates, and if you know Gaelic feel free to contact me and tell me how easy it should be! For those of you who know my background, I won't stop learning Icelandic in the meantime: one of this year's goals is to improve my Icelandic to the point where I can read Egil's saga. 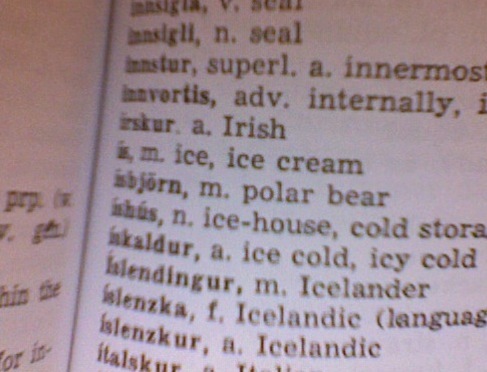 I'll just devote more of my time to this new language for the next three months, while still honing my skills in Icelandic when the chance comes.